Hollywood, 1951. 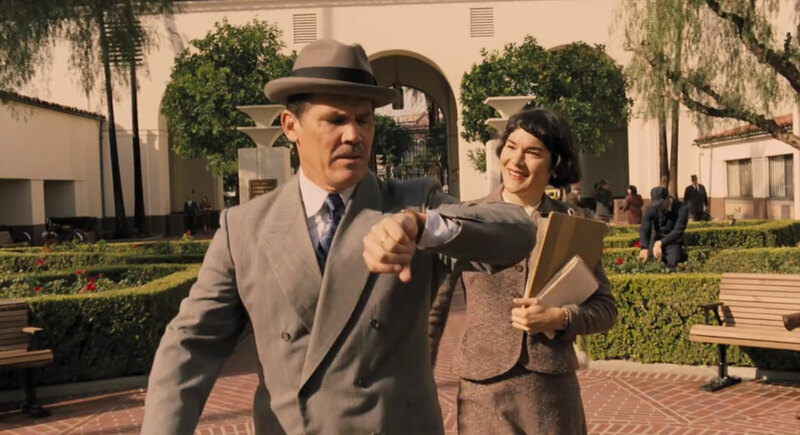 Eddie Mannix (Brolin) is the head of production at Capitol Pictures; he’s also the studio “fixer’, the man who keeps all the stars in line and out of the gossip columns. It’s an average day for Eddie: one of his stars, unmarried DeeAnna Moran (Johansson), reveals she’s pregnant, his boss back in New York wants to take a young Western actor called Hobie Doyle (Ehrenreich) and put him in a period drama directed by European emigre Laurence Laurentz (Fiennes), he’s being headhunted by the Lockheed Company with the promise of a ten-year contract and early retirement, and by lunchtime he’s aware that the star of Capitol’s latest, prestige picture, Hail, Caesar! A Tale of the Christ, Baird Whitlock (Clooney) is missing. Hail, Caesar! is an important movie for the studio, and Eddie is keen to ensure that nothing goes wrong with its production. When he receives a note from “The Future”, the group claiming responsibility for Whitlock’s disappearance, his day is further complicated by rival gossip columnists (and twin sisters) Thora and Thessaly Thacker (both Swinton) who are planning to run stories about Whitlock and want to interview him that afternoon. Eddie fends them off, promising them both exclusive access to Whitlock the next day. Meanwhile, Hobie Doyle’s portrayal of a dapper gentleman in Laurentz’s latest movie, Merrily We Sing, is proving to be disastrous. Laurentz wants Hobie off the picture, while Hobie thinks he’s not doing so well in the role. Eddie tells both of them that there will be no changes. A ransom call from “The Future” has Eddie placing $100,000 of the studio’s money in a valise that he can’t close properly. Doyle, who is meeting with Eddie when the call comes through, lends him his belt to keep it shut, and Eddie hides it in one of the sound stages. Later, after attending the premiere of his latest movie, Hobie sees the valise in the possession of song and dance star Burt Gurney (Tatum). Hobie decides to follow him. Back on the lot, Eddie has to make a final decision about the Lockheed offer, while also finding a solution to the problem of DeeAnna’s pregnancy. And as midnight ushers in another twenty-four hours, it’s still another average day for Eddie. First touted back in 1999, though originally to be set in the Twenties and focusing on a troupe of actors performing a play set in Ancient Rome, the Coen Brothers’ latest has sat on the shelf for a while now, but what was originally a “thought experiment” has developed into a deceptively simple, endlessly endearing movie about the frivolous nature of entertainment and the serious efforts that go into making all that frivolity seem important. There’s also a political element in the form of “The Future”, the group of Communist screenwriters who kidnap Whitlock, and enough affectionate pastiches of Fifties movie making to keep fans of the period more than happy (a song and dance number called No Dames! and featuring Channing Tatum is a particular highlight). But look closely and you’ll also find a number of religious references, from DeeAnna’s out-of-wedlock pregnancy and need for a husband reminiscent of the Virgin Mary’s situation, to the Lockheed Company’s pursuit of Eddie being a clear ringer for Satan tempting Jesus in the desert. Contentious? Probably, but the symbolism is there, and the Coens have a lot of fun with it, adding unexpected layers to a movie that appears quite lightweight on the surface. 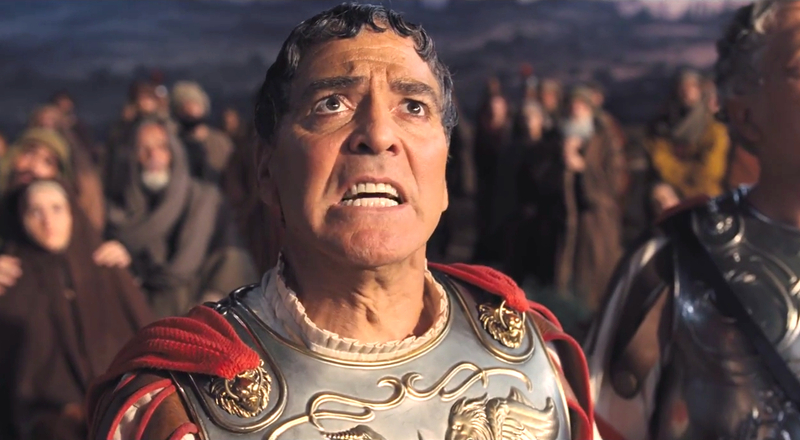 But then there are the clever Hitchcock references as well, the idea of good versus evil, sinning and redemption, and suddenly Hail, Caesar! is more than the fluffy confection that it looks and sounds like. And yet it is also determinedly simplistic in its approach, almost offhandedly so. Eddie faces each problem with an equanimity that seems out of place given the potential for career-ending disaster that faces him at every turn, but then there’s that Lockheed offer he can fall back on if he needs to, so why should he be worried all the time. (It’s actually really simple: he’s that good at his job.) Whitlock embraces the Communist rhetoric of “The Future” because he’s an idiot, an empty vessel who soaks up their ideas in the same way that he soaks up the lines of dialogue in a script – and then parrots them verbatim. It’s no wonder he’s unfazed by his having been kidnapped; like Eddie he lives in a protected bubble: along as he does what he’s supposed to, everything will be all right. Brolin and Clooney both give wonderful performances but in different ways. Brolin displays a gift for understated comedy he doesn’t get the chance to show too often, while Clooney channels the ghost of Cary Grant with every double take and concerted bit of mugging he can squeeze in (“Squint at the grandeur. It’s blinding! It’s blinding!”). Not far behind them is Swinton as the warring gossip twins, exasperated and credulous, while the likes of Johansson, Hill, Tatum, and Lambert are given small but lovingly crafted supporting turns. As the dramatically talent-free Hobie, Ehrenreich is angel-faced yet crafty, and Fiennes is perfectly cast as the despairing Laurentz. The two share a scene devoted to having Hobie say the line, “Would that it were so simple” that is a marvel of linguistic dexterity and comic timing; it’s one of the movie’s many comic highlights. 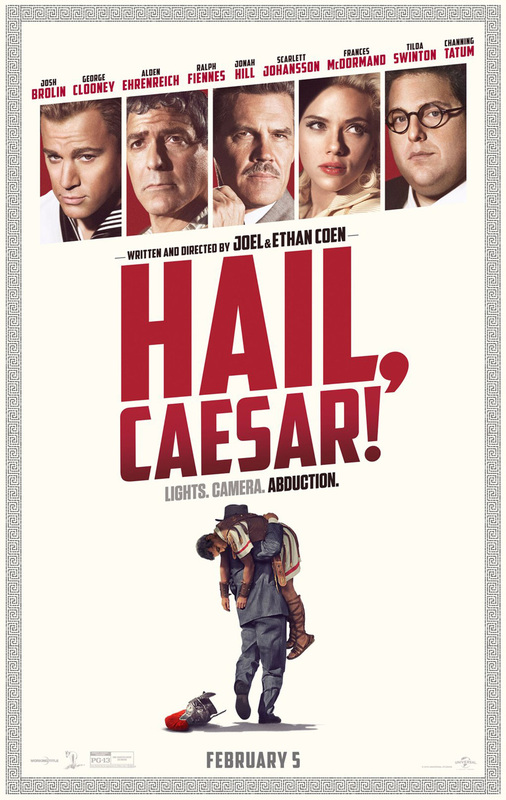 Bolstered by gorgeous cinematography courtesy of DoP Roger Deakins, and allied to the kind of pin-sharp recreation of the period that the Coens are so good at providing, Hail, Caesar! – like a lot of their work – isn’t as straightforward as it seems, and rewards on all kinds of different levels. It seems to be common practice with their movies, to only look at what’s going on on the surface, and dismiss the notion that there’s more going on underneath, as if the Coens were journeyman movie makers, or new to the industry. But this is yet another movie of theirs that is clever throughout and cleverly constructed for maximum effect and enjoyment. 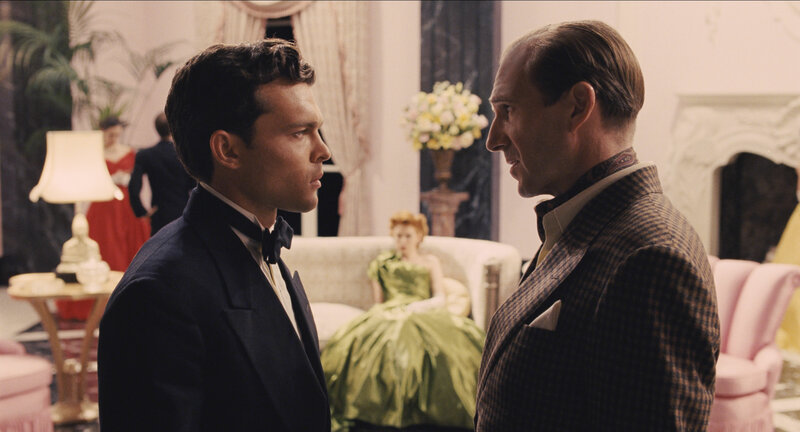 Rating: 9/10 – it may appear slight and lacking in depth, but Hail, Caesar! is a movie that never lets up in its desire to entertain by poking gentle fun at the movies of a bygone era; with a great script and winning performances, the Coen brothers have shown once again that when it comes to their own unique way of movie making, what you see is just the tip of what you get… and it’s damn funny too.